Been having some processing issues with uploading this week's episode of Summer Reload so I have reprocessed it into two parts. Special thanks to the fine staff and Ryan for the warm welcome and tour of this very nice dual hotel brand or as some call them a hybrid hotel. This model features the Residence Inn and Courtyard which are both Marriott brands. It is located near Northlake Mall area just off I-77 at Harris Blvd and HWY 21. Both hotels share the same entrance and front desk area, outdoor pool & fitness center. The complex has spacious lobbies and there are also outdoor patios/courtyard areas in back of the hotel and in front of the hotel. Elevator Photography as we know it started 25 years ago today. 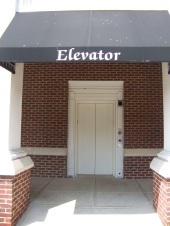 The first elevators involved were at a Hilton property and a Marriott property so I thought I would upload a dual video from the Embassy Suites and Marriott hotels in downtown Winston Salem, NC which are connected by a skybridge walkway and also share the same parking garage (see parking garage video at this link https://youtu.be/HB3BKv6sBNM) I also included the Dover elevator at the walkway between the two hotels. Hope ya'll enjoy this video!